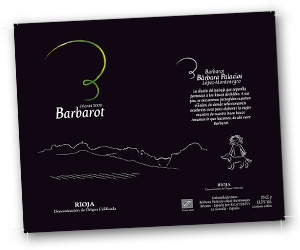 One day, sharing the wine with a group of good friends, the o name Barbarot was born as a result of the symbiosis of Barbara y Merlot. Merlot is the grape variety that makes the difference in the wine. It also is my favourite grape and then name of my pet, Golden Retriever, my best companion and wine dog. From this stage, the first sketches for the label started to flow. The girl and the dog became the visual brand symbol and we wanted to capture it in the final touch. A good family friend of our family, Mar Echegoyen; artist and Bachelor of Arts, began to create these sketches. They were based in the idea to bring a youthful outlook to our brand. We wanted to reflect the personal character of the wine, and at the end it became polished into what it is the actual trademark.